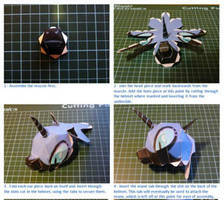 Fully assembled model of the final prototype version of the Nightmare Moon papercraft design. Printed at this scale (four A4 sheets) it stands approximately 20cm (8") high. No major changes were made between this prototype and the final design other than a couple of tweaks to the textures and tab placements. Is there a Luna one? Or maybe you can make one. I need to make this. It'll be hard but I must do it for my favorite MLP villain. This looks epic but I'd never be able to put her together! Oh, silly me. I just read the creative commons license. Nevermind. 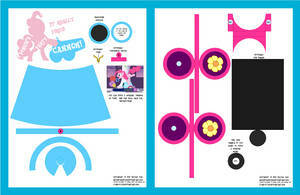 has anypony actually though that paper craft patterns can be used for plushie patterns? Having looked at the patterns plush makers have devised, I can tell you they are nothing alike. While there may be some conceptual similarities in having to visualise how to flatten a three-dimensional object into multiple flat pieces, the differences in materials make them quite different art forms. Fabric flexes, bends and stretches in a way paper cannot, so plush patterns tend to consist of fewer, larger components. 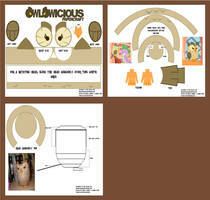 A plush maker will want to minimise seams and joins, whereas in papercraft they are unavoidable. In papercraft the shape of the model is determined by the surface alone, whereas in plush making the stuffing material is a factor as well. Papercraft probably has more in common with 3D computer modelling than with plush design. This kinda reminds me of the N64's graphics. .w. There are some similarities between how video game graphics and papercraft models like this are designed. In the days of the N64 and similar consoles, you had to keep the polygon count (the number of triangular faces that make up the model) fairly low because of the limited processing power; with papercraft you're also limited because making the polygons too small or too numerous makes the model fiddly and difficult to assemble. I kept these models fairly simple in order not to exclude people who aren't already skilled at papercraft assembly, hence the somewhat blocky look. You can make models more complicated and thus smoother-looking - there are other pony papercraft kits more detailed than mine - but you need a lot of time, patience and practice to put them together. woe just wow this is amazing i didnt know you could do something so beautiful with paper!!! I love love love it! Seriously! I'll give it a try and then if I don't mess up a lot I'll try Celestia. Oh please make one of Princess Cadence, or/and Queen Chrysalis! I love love love it! Seriously! Sure I'm going to try this one and then Celestia. Please make one of Princess Cadence! Or/and Queen Chrysalis, please! ooh im printing this out when i get ink. as a similarly-scaled papercraft? I have zero rendering/model-making skills, and GlaDOS/Alicorn crossovers make me feel warm inside. Incidentally, for those who want to pair these with kna's lovely pony papercrafts, they scale nicely at 50% (that is, all four templates on one A3 sheet). At half-scale, though, the paper thickness makes some of the joints more difficult (the head took forever to do, because I had to clamp the joints and let them set one at a time. But I was using 200gsm, so maybe that was my problem). Anyway, awesome model. Any chance you'd do Luna to the same spec? awesome. i just discovered about you and let me tell you that your style is best suited for me than kna's so litle subscribe boton where are thou? maybe someone can make a video and put it on to youtube on how to make it. u done a gr8 job on these. Awesomesauce! Is normal paper ok to use for this? I'd recommend something a little thicker than your normal 80gsm copy paper, especially if you're using an inkjet printer (the ink tends to saturate the paper, and you get bleeding if you use a liquid glue). 120-160gsm thin card is more suitable. I did use regular paper for the early prototypes, but the result are not as good. Holy guacamole! I have to give credit where credit is due: This is fantastic! Simply fantastic! I mean, ALL of your crafts are perfectly colored and on model, but wow, look at the royal sisters! This must have taken ages! You should really be proud of yourself, this is a wonderful work of art. have you thought about making celestia? I'm putting together a test version of her right now. If all goes well I should be releasing the final model in the next few days. AHH!!!! I was in the middle of designing my own!!! D: You have beat me to it! Ah, don't let mine stop you. Mine turned out a good deal more complicated than I anticipated, and is probably not suited to less experienced papercraft makers, while your other models are all based around a simpler template. I'm sure fans will still appreciate having a choice of model types and sizes! I will still make that one, I honestly love it and how like the cartoon she appears. I may make a simpler one. I just finished Princess Luna's model, but I made her legs farrr too long. I think I'll keep the leg lengths the way they are for when I do Celestial and Nightmare, but too long for "little sister Luna." I love this! I intend to make it. Maybe two, since my sister is most adament that she should have one.